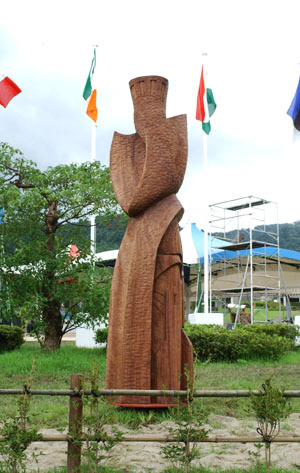 When I received the first letter inviting me to the IIWSC, it said, that my statue should somehow remind of my country. U got an idea of a figure of a king with a fragment of a city, which illustrates our old architecture. Some of the most fascinating sights, that we have been appreciating up today, come from the time of good kings. On the left, there is a shield, a symbol of protection and unity. The head is the crown as well as the battlements of the tower. No specific king is meant. It is a symbol of a good government, a city.